If I had gone to view A Green and Pleasant Land, the exhibition of British landscape photography currently at the Towner Gallery, expecting to be treated to a depiction of a bucolic pastoral idyll, I would have been sorely disappointed. This superb exhibition of images, from the 1970s to now, underlines the fact that the topography of this island is not defined by nature's scenic splendour but is shaped and marked by the multiplicity of human activity and endeavour. This is a landscape that, above all, has been scarred by our place as an industrial nation. Using 1970 as a starting point, the exhibition reveals a world that has been lost and left behind. 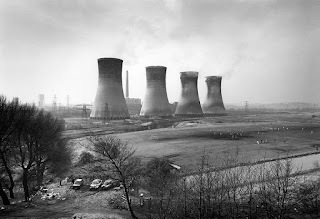 Ron McCormick's atmospheric shots of South Wales mark the beginnings of a post-industrial age and Chris Killip and Graham Smith's similarly monochrome images reinforce the idea of decline in our northern heartlands. If I hadn't already realised the irony in the exhibition’s title, the work of Northern Irish artists Paul Seawright and Donovan Wylie confirmed it. Seawright’s large, full colour daytime shots of the scenes of past sectarian murders, denuded of their terror but given a sinister edge with accompanying text from newspaper reports, were chilling. And Donovan Wylie’s studies of army watchtowers in the lush, green countryside of South Armagh provided a stark reminder that for a large part of this timeframe, an area of Britain was under military occupation. However, it is also leisure that defines our landscape: Simon Roberts and Melanie Friend both use a large colour format to show people at play on the Sussex coast, whether that be paddling in the sea or watching an air show in the skies above; and there is a quartet of early Martin Parr images – unusually for him in black and white. Three are unpopulated but the fourth, Beauty Spot - Brimham Rocks, is more familiarly what Parr is renowned for as he captures day trippers in the throes of their banality. In the first room of the exhibition, it struck me that football is an activity that has had a dominating effect on our environment. In the words of John Davies, "we are collectively responsible for shaping the landscape we occupy"; and that most communal of sports features in two of his three stunning images on display. Agecroft Power Station, Salford dwarfs the two amateur football matches that are taking place on pitches alongside, and his Runcorn Bridge, Cheshire is underpinned by the football graffiti that litters the supports below. Placed alongside Robert Judges' eerie Football Pitch at Dawn, these images reinforced the prominence of the national game in our physical and mental terrain. There are more traditional representations of landscape but even Fay Godwin, former president of the Ramblers Association, uses light and dark and open spaces under troubled skies to create a discomfiting tone. Over fifty artists are represented in this exhibition and the work is drawn largely from the Arts Council Collection. It is an excellent exhibition and it gave me a real sense of the Britain I have grown up in and the Britain I live in today - food for thought for the leaders of our country who seem to be some distance away from understanding our green and pleasant land. A Green and Pleasant Land, British Landscape and the Imagination: 1970s to Now is at the Towner Art Gallery, Eastbourne until 21st January 2018. Entry is free.